Tracey Sylvester Harris mixes the contemporary and the timeless in her large-scale paintings of female sunbathers, citing the bold, sunny light of Edward Hopper and dazzling flat colors of Richard Diebenkorn in a way that not only draws the viewer in closer, but also challenges the viewer to negotiate their gaze in the context of these female subjects. Tempering a sense of nostalgia with a modern approach to composition, Harris aims to remind the viewer that "our own lives are fleeting" and "[to relish] our time in the sun." Close enough to entice without titillation yet distant enough to create pause, Harris's women have a distinctly magnetic quality that is both predicated on the physical and the psychological. Harris knew she was bound for an artistic career from an early age, saying, "I actually can't remember a time when I didn't know I was an artist." Raised by successful working artists, Harris observed that pursuing her passion for art and making a living were not mutually exclusive. Exposure to art galleries and museums further facilitated her interest and inspiration, as did poring over glossy art books at home and creating works of art for her school as a elementary student. 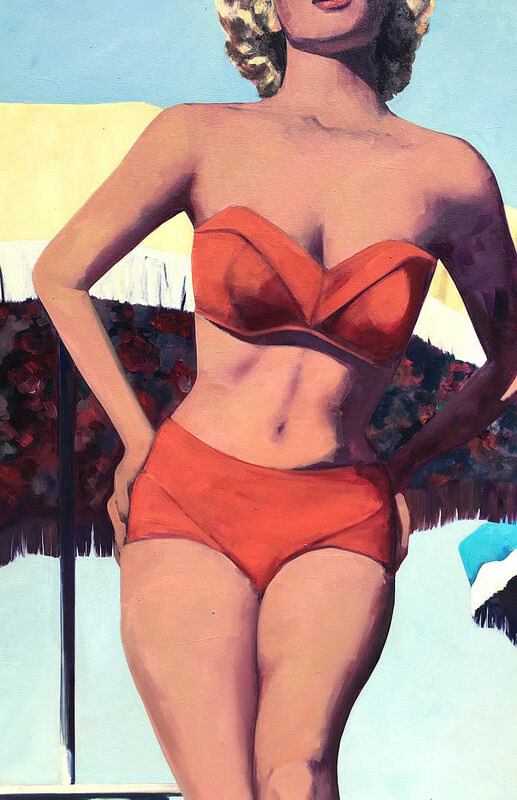 After taking art classes through high school, she found a mentor in California painter and teacher Marian Stevens, who passed on her wisdom on "the figure, composition, and art in general." 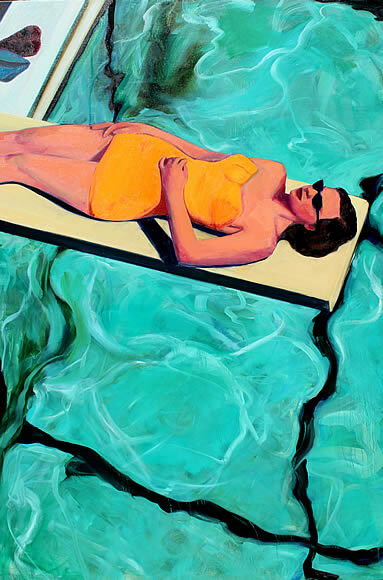 Growing up in Las Vegas cemented her attraction to the bodies of water that feature in her paintings, attuning her to the personalities she finds and recreates in each pool, lake, and ocean. Taking the beaches and water of her San Luis Obispo home as her setting, Harris paints women lying out on towels or swimming, capturing them in moments of repose and relaxation, using vintage photographs and snapshots as references. She adds a further element of mystery and intrigue by denying the viewer direct views of their faces, using creative cropping of the composition to encourage the gaze in unexpected directions, saying, "just think about it: we all love to stare at people, but if they look back at us, manners dictate that we turn away. With my paintings, we have permission to stare and wonder about them indefinitely." 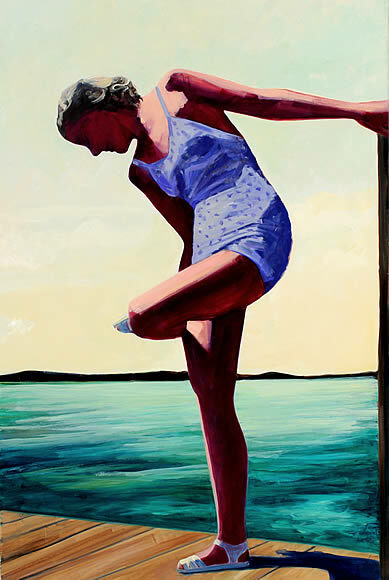 Harris imbues her paintings with an intentional sense of timelessness, choosing to clothe her subjects in retro-inspired bathing suits that surround the figures with an atmosphere of stillness and permanence, as they will never be confined to just one moment in time, but will consistently register and resonate with the viewer. For Harris, the viewer is meant to both identify with the universal, unspecified female figures and stand outside of them as spectator, creating a dynamic dialogue between subject and object. On what she hopes to impart upon her viewers with her paintings, Harris says: "I hope to evoke thoughtfulness in the viewer. I like my work to have an initial attraction, but then for the viewer to see or feel that there is more, to start asking questions about the central issues of human existence: desire and loss, impermanence, and beauty, and the many dimensions of our connections with other."